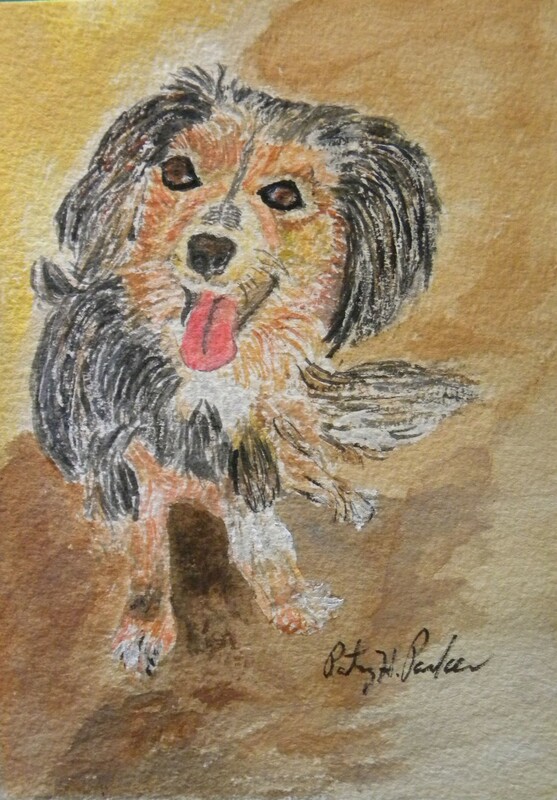 HERE IS A WATERCOLOR PAINTING I DID RECENTLY (AND FINALLY) OF OUR DOG, BROWNIE. IT WAS DONE FROM A PHOTO MY DAUGHTER TOOK OF HER WHEN SHE WAS A LOT YOUNGER. SHE IS MORE GREY IN THE FACE NOW. I WANT TO DO IT AGAIN, WITH SOFTER LINES, THOUGH. BROWNIE WAS SITTING KIND OF SIDEWAYS. SHE HAS A SICKLED TAIL. ONE OF THESE DAYS I’M GOING TO PAINT HER WITH HER TAIL UP. SHE IS A VERY UNUSUAL-LOOKING DOG FOR SURE!!! Posted on May 19, 2015, in My Thoughts, Watercolor Paintings and tagged art, watercolor. Bookmark the permalink. 7 Comments. Thank you, Sherri! I sure love her! That’s okay, Jill! 🙂 It happens a lot anyway.